Paper Dolls Did You Know? Have We Left You Wanting More? Dervla “Dare” Dreadful is the Irish writer cousin of Penelope Dreadful. While Penny is on hiatus, Dare gives us something “Dreadful” for Toys. Maureen is author of the “To The Nines” column. 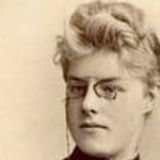 Well-known as the Photo Detective she has authored many books on family history and photography. Janine is the author of The Healing Brush Column. She also owns Landailyn Research & Restoration and is an award winning restorationist. Sheri wrote the “Have We Left You Wanting More?” article. She also authors the blog The Educated Genealogist. Caroline is the In2Genealogy Columnist. She is also the author of the Family Stories blog. Denise authors the blog, The Family Curator and gives us useful advice in ArtiFacts each month. Craig authors the Appealing Subjects column. He also writes the blog Geneablogie. Maven is editor/publisher of Shades Of The Departed The Magazine. She also writes the blog footnoteMaven and Shades of the Departed. Betty Bonnet’’s Valentine. The Lady’s Home Journal.February 1918. In the Collection of the Editor. 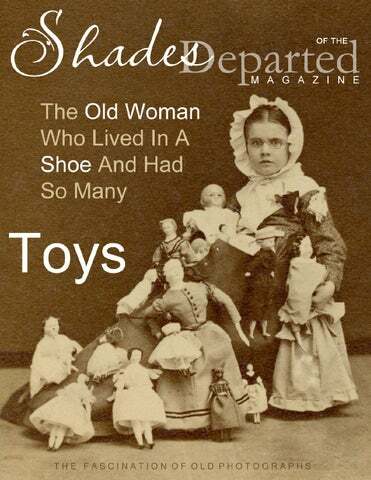 There was an old woman who lived in a shoe. She had so many children, she didn't know what to do; She gave them some broth without any bread; Then whipped them all soundly and put them to bed. Photograph Courtesy of The Jeffrey Kraus Collection www.antiquephotographics.com"
Portrait Image Full Length No Background Date: 1860 - 1868 rarely later Our card may date from 1858 - 1868 based on the above analysis. A ten year span, but there isn’t a great deal of information to go on. There is no photographer imprint and no information from clothing or hairstyles to assist in dating. The Polly Baby Charmer, Advertisement in The Ferrotype and How to Make It, by Edward M. Estabrooke, 12th Edition, publ. 1903 by The Anthony & Scovill Company, New York and Chicago. he	old	show	business	maxim,	often	credited	incorrectly	to	W.C.	Fields,	to	'never	work	with	children	or	animals'	might	well	have	been	a	frustrated	cry	of	the	early	studio	photographer. Both	can	behave	unpredictably,	particularly	in	unfamiliar	surroundings,	and	any	proud	parent	knows	there's	only	a	brief	window	in	which	to	get	a	snapshot	of	'little	Johnny'	before	his	attention	wanders. It	would	have	been	tricky	for	daguerreotypists	and	early	wet-­‐plate	practitioners	to	persuade	young	children	to	endure	absolute	stillness	for	the	lengthy	exposure	time	necessary. Any	movement	and	the	child's	face	would	be	smudged	into	anonymity	Fig. 1. The	techniques	used	for	adults,	such	as	neck	clamps,	didn't	work	as	well	with	children. Consequently	many	early	portraits	of	children	will	show	them	held	Airmly	on	laps	and	between	legs,	in	some	cases	attempts	being	made	to	disguise	the	presence	of	an	adult,	often	with	comical	results	Figs. 2,3. Smaller	children	were	often	tied	to	a	chair	with	a	bow	around	the	waist. For	babies,	to	be	frank,	the	easiest	option	was	for	them	to	be	asleep	Fig.4. As	might	be	expected,	these	charming	instruments	rarely	made	it	into	the	portraits	themselves	and,	judging	merely	by	the	paucity	of	images	online,	few	appear	to	have	survived. This	makes	it	difAicult	to	assess	how	commonly	used	they	were,	although	the	endurance	of	the	phrase,	"Watch	the	birdie,"	in	popular	culture	is	a	testament	to	how	ubiquitous	they	were	at	one	time	Fig. 9.
mediocre	picture	into	a	Aine	portrait	Fig. elaborate	miniature	steam-­‐powered	versions	were	already	available	to	those	who	could	afford	them. two	boys	in	sailor	suits	who	visited	W.W.
twentieth	century	craze	for	pond	boats. are	limited	to	a	diamond-­‐pattern	carpet. Brett	is	a	geologist	by	training,	but	his	passion	is	old	photographs,	the	photographers	who	took	them,	the	equipment	and	technologies	they	used,	the	people	and	scenes	in	the	photos,	and	the	stories	behind	them. Brett	can	be	found	on	the	Photo-­Sleuth	Blog,	solving	the	mysteries	found	in	old	photographs. He	is	also	available	to	give	talks,	presentations	and	workshops	on	a	wide	variety	BRETT PAYNE Tauranga, New Zealand of	photohistorical	topics. Please	contact	him	through	the	Photo-­Sleuth	Blog. Brett’s	Favorite	Toy A	succession	of	wheeled	vehicles,	including	a	couple	of	scooters,	two	bicycles,	and	then,	in	my	second	childhood	(ie. 20s),	a	motorcycle. Forrest R. Pointer metal toy tractor; privately held by R.L. Pointer. R.L. Pointer was given the tractor by his father, Forrest R. Pointer. U*4"0'% dQ,0'*e% >)/-"'4@% 6&'-% $&'% 6,$% ,% 3&/0.1% % (&/$% ")*% 6,$% 94)5,50*% '/"&'4% D,. '% ,-.% Myrtle E. (Haley) Pointer miniature bisque doll; privately held by R.L. Pointer. R.L. Pointer was given the doll by his mother, Myrtle Pointer. Google	Books	[Link]	Google	Images	[Link]	Wikipedia	[Link]	ebay	[Link]	Etsy	[Link]	YouTube	[Link]	Because	many	vintage	and	antique	toys	are	collectible	(and	some	of	them	highly	collectible),	there	are	quite	a	few	websites	and	blogs	on	the	Internet	that	can	help	us	Aind	some	information	about	speciAic	toys	including	how	to	Aind	toy	patent	information	if	we	are	really	needing	speciAic	information	about	the	toy	for	our	research. The	following	are	some	good	websites	with	this	type	of	information	and	tips: All	About	Old	Toys	[Link]	Toys	and	Games	[Link]	Vintage	Toys	Blog	[Link]	If	we’re	still	needing	more	information,	we	can	always	stop	by	our	local	library	and	look	at	toy	collector	reference	books	and	toy	history	books. Searching	Google	(Web),	Google	Images,	and	ebay	is	how	I	determined	what	kind	of	doll	this	one	of	Myrtle’s	was	and	what	its	approximate	age	might	be. It	was	tedious,	but	necessary,	to	go	through	all	of	the	online	images	as	there	are	many	types	of	these	miniature	dolls	with	small	variations	that	can	indicate	speciAic	time	periods. For	example,	Myrtle’s	doll	is	not	shiny,	has	no	identifying	marks,	has	movable	arms	and	legs,	the	color	of	the	hair	and	the	color	of	the	features	on	the	face	are	worn	quite	a	bit,	it	does	not	have	painted-­‐on	socks	and	shoes,	and	the	hair	is	molded	–	not	life-­‐like	hair. Additionally,	the	body	and	limbs	seem	to	be	hand-­‐sculpted	which	made	me	think	at	Airst	this	was	a	handmade	toy	and	not	a	manufactured	toy. But	then	I	found	this	collection	of	miniature	bisque	dolls	on	ebay	and	the	baby	in	the	middle	deAinitely	reminded	me	of	Myrtle’s	doll	and	this	baby	has	“Japan”	stamped	or	etched	on	the	back. [Link]	The	seller	suggests	it’s	from	the	1930s. Then,	I	also	found	this	other	collection	of	miniature	bisque	dolls	that	also	looked	similar	to	Myrtle’s. Even	though	this	ebay	listing	takes	a	guess	at	the	date	-­‐-­‐	from	the	1910s	to	1920s	-­‐-­‐	we	can’t	be	too	sure	they	are	correct. However,	after	looking	at	all	the	other	variations	and	time	periods,	I’m	thinking	their	guesses	are	pretty	close. [Link] I	feel	somewhat	conAident	about	the	information	for	now. This	doll	was	probably	made	sometime	before	or	around	Myrtle’s	birth	or	early	childhood	and	because	of	that,	it	may	have	been	a	toy	passed	down	to	her	from	her	mother,	or	it	may	have	been	one	that	was	maybe	purchased	and	given	to	Myrtle. It	was	probably	manufactured	in	Japan,	or	maybe	even	Germany. Most	importantly,	Myrtle’s	photograph	tells	us	she	deAinitely	had	and	played	with	baby	dolls	when	she	was	a	child. RESEARCHING HANDMADE TOYS What	about	the	handmade	toys	like	Toy’s	handmade	tractor	and	hoop? How	do	we	research	those	types	of	toys? We	must	sit	down	and	visit	with	those	older	family	members,	ask	them	for	their	toy	stories,	ask	them	about	their	toys,	Aind	out	what	their	favorite	toys	were,	and	see	if	they	will	reveal	the	stories	hidden	in	their	toys. Then,	record	what	they	remember	and	photograph	the	toys	if	they	still	exist. Here	are	some	general	questions	to	ask	them: What	do	you	remember	about	the	toy? How	did	you	get	the	toy? Who	gave	the	toy	to	you? When	did	you	get	the	toy? Birthday? Some	other	special	holiday? How	often	did	you	play	with	it? Did	you	share	it? 1. Pointer family traditions regarding the nickname of Forrest R. Pointer, [Address for Private Use,] Conroe, Texas), as reported by Donald D. Pointer, brother to Forrest, 2009. Information has been verified with other events. 2. “Mr. and Mrs. Elmer Haley Feted on Anniversary,” Ames Daily Tribune, 12 April 1960, p.12, col.3; digital images, Newspapers.com (http://www.newspapers.com/ : 30 Nov 2013). 3. “Iowa Center: Early Party,” Ames Daily Tribune, 22 Dec 1959, p.8, col. 4; digital images, Newspapers.com (http://www.newspapers.com/ : 30 Nov 2013). 4. Donald D. Pointer, “Autobiography,” p.3, MS, ca. 2000. Pointer Family Archives; Privately held by Caroline M. Pointer, [Address for private use,] Conroe, Texas, 2009. [Print-out from computer by author Donald D.
/$% ,% &,99*% 3&/0.1Z% % ()% C''9% C/.$% 5+$*% ,-.% "&'4'<)4'%&,99*@% M/00/,D% 9+50/$&'.%"&'%")D'% More elder elves making toys. The top shot appears to be in an industrial location. If you save the good you find Odds and ends of every kinds You can make some tin can toys, Just like these, little girls and boys. BEATING PLOUGHSHARES INTO. . .? One	of	the	most	controversial	of	Black	Americana	Collectibles. ABOVE: Daguerreotype of Queen Victoria and the Princess Royal with her doll c.1845. Princess Victoria’s Handwriting in the book she kept listing her dolls. Reproduced in “Queen Victoria’s Dolls,” The Strand Magazine, 1892. Protecting An Antique Book I	have	a	bound	book	of	Godey’s	magazines	from	1862. The	binding	is	falling	apart. I	keep	it	in	a	soft	cloth	bag. Right	or	wrong? It	depends? The	soft	cloth	bag,	if	made	from	cotton	or	even	polyester,	is	Aine. But,	cloth	does	not	provide	support	for	a	fragile	book. If	your	book	has	a	weak	or	damaged	spine,	if	pages	are	loose,	or	if	the	covers	are	wobbly,	a	four-­‐Alap	enclosure	or	book	box	might	provide	better	long-­‐term	care. These	products	are	available	from	library	and	archival	suppliers	(Hollinger	Metal	Edge	and	Brodart). Whether	you	keep	your	book	in	a	cloth	bag	or	a	box,	it	is	important	to	select	a	suitable	storage	location	inside	your	home	where	the	temperature	remains	fairly	cool	and	constant. Avoid	excessive	moisture	and	exposure	to	dust,	pollutants,	and	pests. Congratulations	on	your	treasure. The	Family	Curator How	To	Archive	Family	Keepsakes:	Learn	How	To	Preserve	Family	Photos,	Memorabilia	&	Genealogy	Records by	Denise	May	Levenick	(Family	Tree	Books,	2012) Available	in	ebook	and	paperback	from	Amazon,	iBooks,	Barnes	and	Noble,	ShopFamilyTree.com,	and	retail	bookstores. Adapted from “A Doll’s Story” by Ernest Gilmore A Serial for The Doll’s Dressmaker, 1893. 14 image windows, but only 7 images, two film slides, one for each eye, making the View-Master a stereoscopic image. Hover	over	one	of	the	corners	of	the	transform	selection	until	a	double-­‐sided,	curved	arrow	appears,	then	move	the	selection	in	the	direction	you	want	it. When	the	image	is	following	the	direction	of	the	window,	hover	over	the	corners	again,	until	the	double-­‐sided	arrow	is	going	straight	up	and	down	from	the	corner. Move	the	corners	in	until	the	image	Aits	inside	the	window. You	can	also	move	the	image	around	with	the	cursor	or	the	up,	down,	left	and	right	arrows	on	your	keyboard. That’s	pretty	much	all	there	is	to	it! Just	continue	to	select	and	paste	into	each	of	the	windows	around	the	reel! photo	into	a	gorgeous	one. The	iCloud	synchronization	makes	those	photos	instantly	accessible	on	the	iPad	for	editing	on	a	larger	screen. I	already	have	the	Hipstamatic	camera	app	which	lets	me	experiment	using	combinations	of	Ailm	types	and	lens	rather	than	the	Ailters	found	in	most	apps. The	retro	camera	workspace	at	Airst	looked	much	too	simple	to	generate	anything	impressive,	but	it	wasn't	long	before	I	was	experimenting	with	a	growing	collection	of	lenses	and	Ailm	types. Fortunately	the	digital	lenses	for	the	Hipstamatic	are	much	cheaper	than	the	physical	ones	on	a	standard	camera	and	there	are	a	number	of	convenient	packs	combining	interesting	lenses	and	Ailms. If	you	could	see	your	way	to	stick	one	or	two	into	my	stocking	I	would	be	ever	so	grateful. purchases	up	to	$2.99]	app	can	turn	those	photos	into	works	of	art. Using	both	together	can	generate	some	amazing	results. Having	wonderful	family	photos	is	only	one	part	of	a	family	historian's	purpose	in	life. Telling	stories	is	another. There	are	two	very	special	journaling	apps	that	I	really,	really	must	have. The	Airst	is	the	Day	One	app	[$4.99	-­‐	iOS	and	$9.99	-­‐	Mac]. With	it	on	my	phone,	it	would	be	with	me	all	the	time	so	I	could	capture	those	moments	as	they	happen. And,	I	can	do	it	with	pictures	too	since	it	includes	a	camera. It	also	date	stamps	each	entry,	geo	tags	it	with	my	current	location	(when	set)	and	includes	the	weather	at	that	place	at	that	time. How	amazing	is	that? There	is	one	part	of	me	that	Day	One	can't	automatically	capture	and	that	is	my	doodling. Fortunately	there	is	another	journaling	app	that	will. It's	called	Paper	[free	with	in-­‐app	purchases	up	to	$6.99]	and	it	serves	as	a	digital	artist's	journal. Using	it	I	can	release	my	inner	artist	by	doodling,	drawing	and	even	painting. And,	I	can	export	individual	pages	as	images	to	include	in	my	Day	One	journals	or	even	send	them	on	to	my	my	blog. French Postcard. Hand tinted real photo postcard from a series of photographs of c h i l d r e n . Wr i t t e n o n t h e b a c k , postmarked 1911, with original Belgian postage stamp. Right: Unmounted Photograph Two Young Girls With Dolls One with a matching dress Poor children, the dolls look cleaner than they do. Above: Card Mounted Photograph Young Girl And A Toy Tea Set No Photographer Information Right: Advertisement for a tea set from 1900-­‐1901	from	a	trade	catalog. Above: Cabinet Card A Young Boy and A Horse Photographer: A. Hurdus 83 Canal St. New York Right: Advertisement for toy horses from 1900-­‐1901	from	a	trade	catalog. P[N[2SVP;% FXPH% D,:,Y/-'% $''C$% ")% 9+50/$&% "&'% &/:&'$"% b+,0/"*% 3&/0.4'-#$% :'-',0):*% D,:,Y/-'% ")% '-:,:'% )+4% ,+./'-3'% )<% '-"&+$/,$"/3% *)+-:% <,D/0*% &/$")4/,-$% ,-.% :'-',0):/$"$% )4% $))-% ")% 5'%<,D/0*%&/$")4/,-$%,-.%:'-',0):/$"$1 P[N[2SVP;%FXPH%D/$$/)-%/$%")% /-$9/4'% 3&/0.4'-%")% ,% 0/<'0)-:%0)='% )<% :'-',0):*% ,-.%<,D/0*%&/$")4*1 Join us on faceBook [LINK] for publication updates and submission guidelines. P'-',0):*% [-"4'94'-'+4% /$% ,% :'-',0):*% 5+$/-'$$%/-"'4'$"%9+50/3,"/)-%. '=)"'.%")% " & '% $ D , 0 0% 5 + $ / - ' $ $% : ' - ' , 0 ) : *% '-"4'94'-'+4#$% ./='4$'% 3&,00'-:'$% )<% 5+$/-'$$%)6-'4$&/91% L ) - " , / - / - :% < ' , " + 4 ' .% : ' - ' , G '-"4'94'-'+4$@% "',3&'4$@% 0'3"+4'4$@% 4'$',43&'4$@% $)<"6,4'% . '='0)9'4$@% 94).+3"% D,-+<,3"+4'4$@% ,+"&)4$@% 9+50/$&'4$@%'='-"%94)D)"'4$@%h%D)4'1% (&'%:),0% /$%")%34',"'% ,%3)DD+-/"*%6/"&% "&'% D,:,Y/-'GG,% 90,3'% ")% :)% ")% :'"% ,-$6'4$%")%5+$/-'$$%3&,00'-:'$1 Join us on faceBook [LINK] for publication updates and submission guidelines. Elijah B. Core, (1853-1931) a childrenâ&#x20AC;&#x2122;s portrait specialist, was the President of the PAA in 1901 and is listed with the New York City address of 572 Fifth Ave. Before setting up a studio in Manhattan at the turn of the century, Core had first been in business in Lincoln, IL from 1874-1884 and then moved to and established a business in Cincinnati, Ohio, where he maintained studios as E.B. Core & Co. at 56 W. Fifth, 1885-87; 58 W. Fifth, 1888-92; 206 W. Fourth, 1895-99. The Decatur Daily Republican of 15 March 1897, noted that Elijah B. Core, once a photographer of Lincoln, is to launch a fine photo boat at New York, to do business in coast and river towns. While running his Cincinnati studio, Core also shows up in the city directory of Newport, Kentucky, a short distance across the river from Cincinnati, where he also operated a studio at 111 Taylor in 1890 and identified as Core, Elijah B., photographer, 27 W 3rd in Newport in the 1892 directory. (2.) At around 20 years of age, Core established his first studio in Lincoln, Illinois, in 1874. A magazine about the fascination with old photographs.